I'm Chappie and I live in the south of Belgium. I'm originally from France I'm 23 years old ! I play the piano since I was 7 years old. I enjoyed composing music for a long time. However, I had to stop praticing for the last three years in order to stay focused on my studies. Obviously I recently found out that I just missed it too much, so I'm back to it, and here I am ! My favorite classical composers are Dvorak, Tchaikovsky, Purcell, Berlioz and above all Jacques Offenbach. I love operettas. Besides Classical Music, I listen to symphonic metal a lot. Welcome! Offenbach is one of my favorites too - there aren't many of us! Welcome aboard, Chappie! I hope you enjoy your time here. Howdy Chappie. Greetings from Beethoven's Vienna. Welcome to the forum. I'm also a part time metalhead, a piece of my musical identity. Thank you very much for this welcome, Mc Ukrneal, Mirror Image, Hollywood & Le Moderniste !! Glad to know I have some company concerning that kind of music I completely love Nightwish and a bit Rhapsody of Fire. I don't know Avantasia/Helloween and Stratovarius very well, so I'm just gonna add them to my playlist and I'll tell you what ! Nightwish aside, my favorite bands are Epica, Whyzdom, Diablo Swing Orchestra and Eluveitie Do you know them ? Thanks ! I know right What is your favorite opera from him ? Hi Chappie, and welcome! Nice list there, and as far as Offenbach goes, what's not to like? 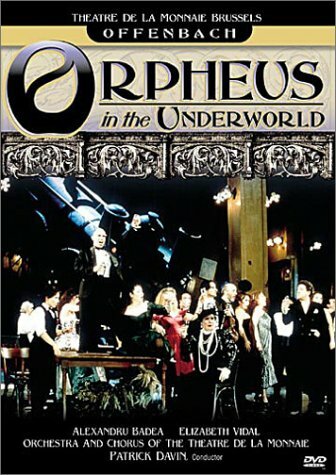 I am particularly fond of this production of Orpheus in the Underworld, directed by the late Herbert Wernicke at La Monnaie in Brussels. In any case, enjoy your time here. You should add Ayreon to your list, it's not symphonic metal per se (more prog rock/metal) but the guy who runs the project (its not a band) works with quite a few symphonic metal, power metal and Gothic metal singers, it's a giant scifi opera. Vandermolen and I will begin to acclimate you to early and mid-20th century British composers . . .